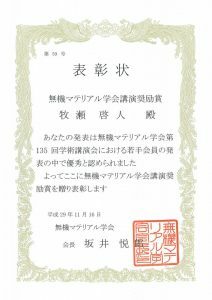 Mr. Kei Makise won a presentation award in the 135th Annual Meeting of the Society of Inorganic Materials, Japan held on Nov. 16-17th, 2017. His thesis is‘Ion-exchange reaction of the layered lepidocrocite-type titanate’. He carried out the ion-exchange reaction of K+ ion in the layered lepidocrocite-type titanate with Na+ ion and clarified the crystal structure of the ion-exchanged compounds by using synchrotron X-ray diffraction data and the ion-exchange property.